Though a bit late, welcome to the Au13 Construction watch! What is Au13? It is the park's most anticipated project in years, set to open for the 2013 season. Let's take a trip back to 2008 real quick. Cedar Fair was new for California's Great America (Otherwise known as CGA) and the park had just received a used Top Spin ride from the now closed Geauga Lake. It was also the park's first Halloween Haunt event. During this time, a photo circulated the web, stemming from the IAAPA trade show. Many enthusiasts were quite excited at the site of this. 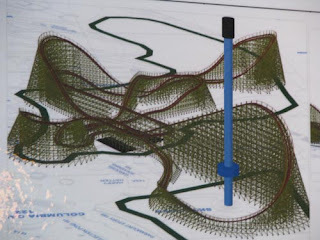 The proposed coaster was to be designed and built by Great Coasters International, Inc (or GCII) and was to be built on the former Whizzer site. As pictured, the first drop was to wrap around the park's signature Star Tower attraction, an original CGA ride. Later down the road, Cedar Fair had a press release regarding the coaster as it was set to open in 2009. Then the coaster project seemed to hit a very long brake run, appearing as though the project completely vanished. Many anxious fans were left wondering while many others believed that the project was scrapped altogether. Many believed (based on several news outlets) that the park's neighbors put it to a screeching halt. When things were finally resolved, there was the whole dilemma with the future 49ers stadium project that Cedar Fair was butting heads with. Fast forward to 2011. No new attraction has come in and we learned that CGA will be removing their Invertigo coaster. This left many CGA fans disappointed at the fact that yet another attraction was removed and nothing new has been added. Many believed that this was these were the park's final days. Late summer, a group of coaster enthusiasts from Theme Park Review came to visit the park and had a Q&A session. It was somewhat confirmed that the wood coaster project was not completely dead but there was no definite time frame. While that was a relieve, it also left many haning and wondering. Come September 2011, Cedar Fair announces that they will be letting go of CGA, selling the park off to a ski resort and real estate company JMA (or otherwise known as the 49ers, though that's not a true/accurate description). A long 3 months go by when we discover that the JMA purchase fizzled out and Cedar Fair was to remain the longterm owner of the park. Many fans rejoiced and had hope that maybe this project could still happen, the few of us anyway. 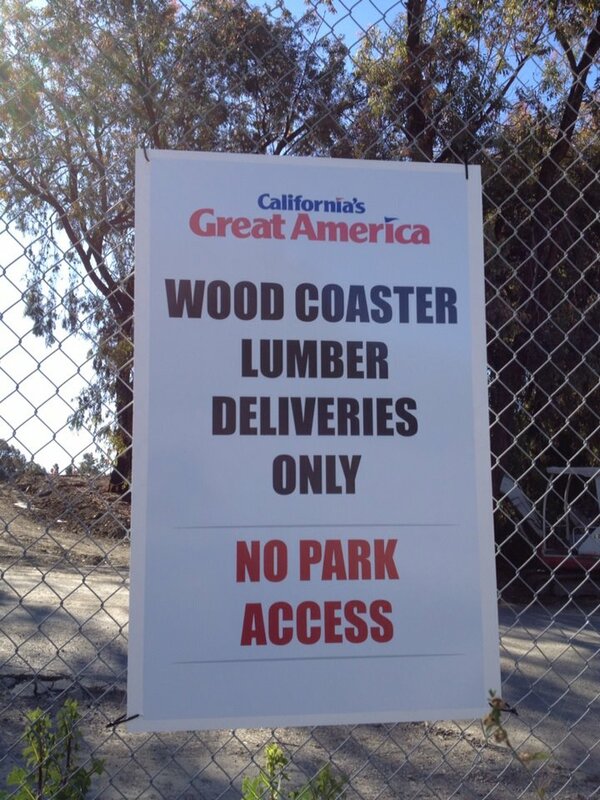 Several news sites reported on this and noted that CGA will be seeing a roller coaster attraction for the 2013 season though they never said what it would be. Speculation begins once again, and many see light at the end of the long tunnel. I discovered that the park had applied for permits and was to have an architectural meeting later in March. This was for a wooden coaster! Watching Santa Clara's permit center web page like a hawk, I followed almost every update trying to decipher what actions were happening. Later on in May, the park appeared to get the green light to get the project rolling and began ground breaking. With this said, the project is officially alive! Great America shares a photo of the now cleared Whizzer site via their Facebook page. Many fans of their Facebook had no clue what was going on while there were a handful that knew exactly what was going on! I could not help it but make a trip out there that weekend and snap some photos of the now cleared site. Since, I've been visiting every other week to follow up on the project and take more photos as the site evolved. This was only the early ground work phase meaning there was a long road ahead before any form of footers would be going in. This was one of the last sites of the former Whizzer footers and pond, shown in the top left by the so-called "Slaughter House" tent. More ground work, more is leveled out and some of the old paths leading up the the defunct Pictorium are demolished. The ground seems to have had taken more shape. Also, part of the midway was torn up along with the planter box where the Mt Rushmore sat. While there was not a whole lot to see prep-wise, it was found that there was already bundles of lumber sitting on site in the "Alleyway" parking lot behind the Pictorium and Star Tower. 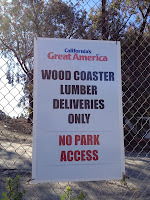 A fellow enthusiast found a sign over on one of the side streets noting about lumber deliveries for wooden coaster. Dead give away much? I'd say so! Finally we are seeing some great progress with the project, in terms of being able to see how the layout will somewhat be. During this month, a couple foundations are being prepped, one of them clearly showing a turnaround and the other one also appears to be a turnaround but seems a bit less obvious. I unofficially named the 2 cement slabs being made "Curly Fry" and "Drumstick" due to their shapes they formed. Who doesn't like drumsticks and curly fries anyway? It appears that the ride will be built on cement slabs and narrower footers that appear to be merged into a 'strip' that will bridge the gaps between the 2 slab foundations. Last day of July, a friend sends me a text: "Hey, Great America's finally building the wooden coaster!" Me, initially thinking, "Um...they've been..." but then decided to ask him to send me a photo of its progress instead as it was my 'off weekend' from visiting the park. Well, when he said they were building it, he meant it literally! The coaster officially went vertical! The park provided a teaser showing a miner holding a nugget against a gold-ish lit background with the text reading "Striking new records, August 29th." We will officially find out on August 29th about the project! That weekend I decided to visit the park again to see the progress myself and it was amazing to see in person. It was very surreal to see such thing rising above the construction wall. I snapped a few more clearer photos of the activity going on to add to my collection of photos. Also the park mounted a huge banner, covering up that plain-looking construction wall showing the same teaser message. Well, that wraps up what I've got for now. I'll be back out at the park this weekend for another visit and check out the progress!